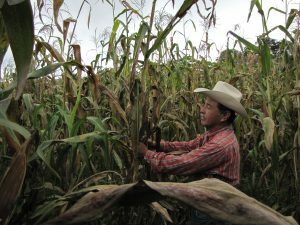 Felix Corzo Jimenez , a farmer in Chiapas, Mexico, examines one of his many maize plants infected with tar spot complex. Named for the telltale black spots that cover infected plants, TSC causes leaves to die prematurely, weakening the plant and preventing the ears from developing fully, cutting yields by up to 50 percent or more in extreme cases. Caused by a combination of 3 fungal infections, the disease occurs most often in cool and humid areas across southern Mexico, Central America and into South America. The disease is beginning to spread, possibly due to climate change, evolving pathogens and susceptible maize varieties, and was reported in important maize producing regions of central Mexico and the northern United States for the first time last fall. To develop the TSC resistant maize varieties that farmers need, the Seeds of Discovery (SeeD) initiative is working to “mine” the CIMMYT genebank for native maize varieties that may hold genes for resistance against the disease. 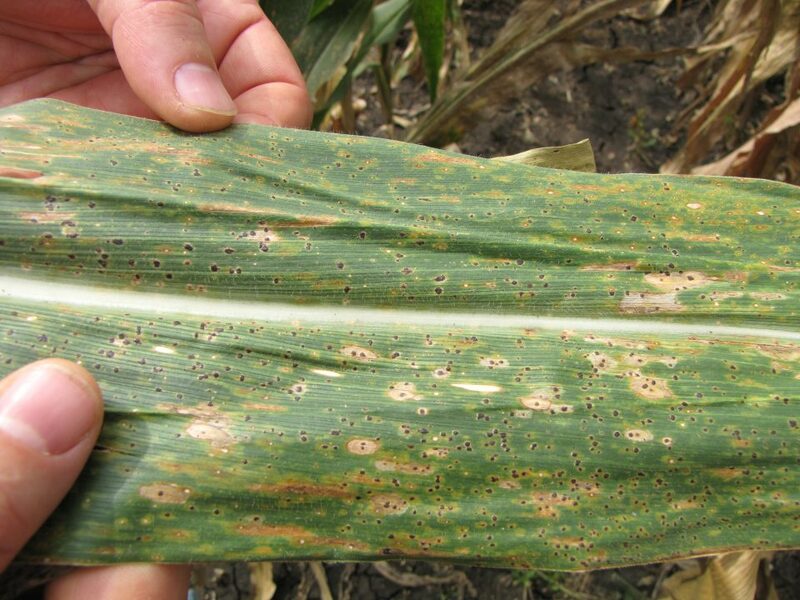 The first stage of fungal maize disease TSC, with tiny, black “tar spots” covering the leaf. The spots will soon turn into lesions that kill the leaf, preventing photosynthesis from occurring. The majority of maize varieties planted in Mexico today are susceptible to TSC, meaning that farmers would have to spray expensive fungicides several times each year to protect their crops against the disease, a huge financial burden that few can afford. Creating varieties with natural resistance to tar spot is an economical and environmentally friendly option that will protect the livelihoods of the region´s smallholder maize farmers. “This project targets the many farmers in the region with limited resources, and the small local seed companies that sell to farmers at affordable prices,” said Terry Molnar, maize breeder with the SeeD project. The key to developing maize varieties with resistance to TSC lies in the genetic diversity of the crop. For thousands of years, farmers have planted local maize varieties known as landraces, descendants from ancient maize varieties that have adapted to their environment. Over centuries of selection by farmers these landraces accumulated specific forms of genes, or alleles, which helped them to resist local stresses such as drought, heat, pests or disease. These novel genetic traits found in landrace maize can help breeders develop improved maize varieties with resistance to devastating diseases such as TSC. However, it is quite challenging for breeders to incorporate “exotic” landrace materials into breeding programs, as despite their resistance to stresses found in their native environment, they often carry unfavorable alleles for other important traits. A maize ear with shriveled kernels that are poorly filled, a major side effect of TSC that reduces farmer’s yields. To help breeders incorporate this valuable genetic diversity into breeding programs, SeeD works to develop “bridging germplasm,” maize varieties created by transferring useful genetic variation from landraces held in the CIMMYT genebank into plant types or lines that breeders can readily use to develop the improved varieties farmers need. This bridging germplasm is created by crossing landrace materials with CIMMYT elite lines, and selecting the progeny with the genetic resistance found in a landrace without unfavorable traits breeders, farmers and consumers do not want. 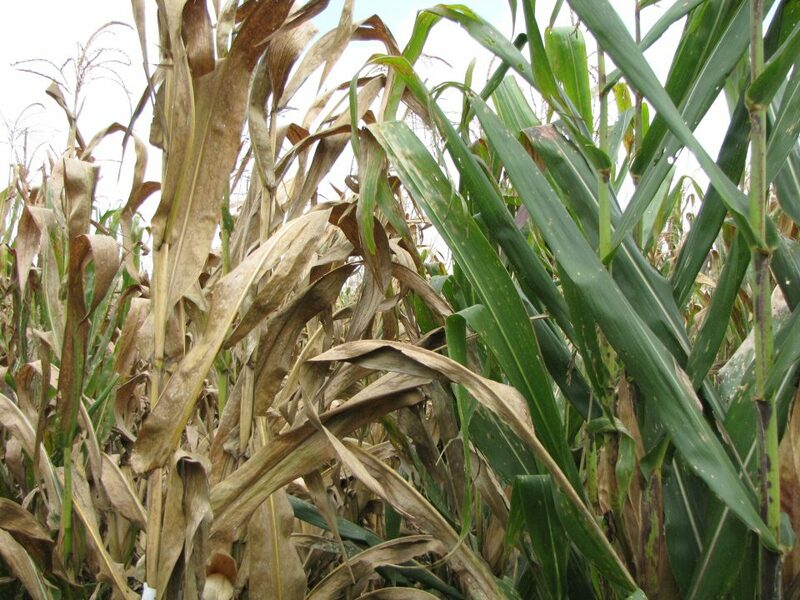 A susceptible maize variety infected with TSC (left) compared to a healthy maize plant , a resistant variety immune to the disease (right). SeeD scientists began by identifying landrace varieties with genetic resistance to TSC. 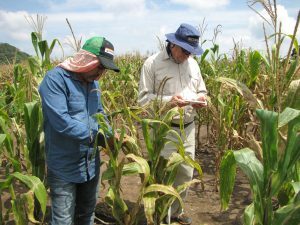 Trials conducted in 2011, 2012 and 2014 evaluated a “core set,” which is a genetically diverse subset of the maize germplasm bank, in search of resistant varieties. “Of the 918 landrace varieties planted in 2011 and 2012, only two landraces—Oaxaca 280 and Guatemala 153—were outstanding for tolerance to the disease,” said CIMMYT’s maize landrace improvement coordinator Martha Willcox, who conducted the evaluations. Genotypic data would later confirm the presence of unique resistant alleles not currently present in maize breeding programs that could be deployed into SeeD’s bridging germplasm. This bridging germplasm will be available to breeders for use in developing elite lines and varieties for farmers. “As a breeder, I’m excited to work with SeeD’s bridging germplasm as soon as it is available,” said Felix San Vicente, CIMMYT maize breeder working with the CGIAR Research Program on Maize and the Sustainable Modernization of Traditional Agriculture (MasAgro) project. 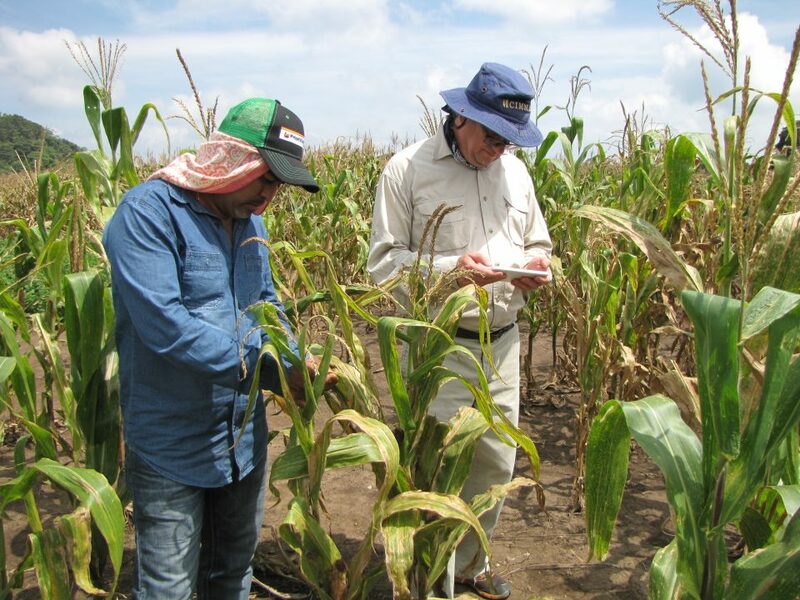 Terry Molnar, maize breeder with SeeD, and Enrique Rodriguez, field research technician with SeeD, evaluate bridging germplasm for resistance to TSC. Up to this point, most breeders have only used elite lines to develop hybrids, because landraces are extremely difficult to use. This practice, however, greatly limits the genetic diversity breeders employ. 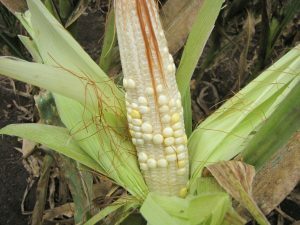 Using novel alleles from maize landraces allows breeders to develop improved hybrids while broadening the genetic variation of their elite germplasm. This novel genetic diversity is very important to protect crops from evolving pathogens, as it means the varieties will have several resistant alleles, including alleles that have never been used in commercial germplasm before. The TSC resistant bridging germplasm developed by SeeD has been tested in on-farm trials in TSC-prone sites in Chiapas and Guatemala, with promising results, and will be publicly available to breeders in 2017. In the meantime, local farmers look forward to seeing the results of this research in their own fields. “A variety with the disease resistance of a landrace and the yield and performance of a hybrid is exactly what we need,” Corzo Jimenez said. 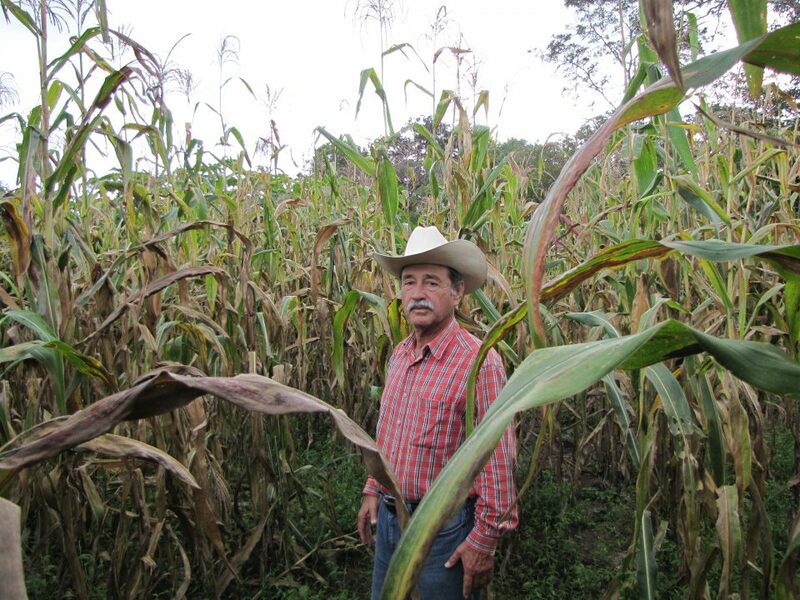 Corzo Jimenez in his maize field infected with TSC. Varieties made from SeeD bridging germplasm would allow him to protect his crop without applying expensive fungicides. SeeD is a multi-project initiative comprising: MasAgro Biodiversidad, a joint initiative of CIMMYT and the Mexican Ministry of agriculture and rural development (SADER) through the MasAgro (Sustainable Modernization of Traditional Agriculture) project; the CGIAR Research Programs on Maize (MAIZE CRP) and Wheat (WHEAT CRP); and a computation infrastructure and data analysis project supported by the UK’s Biotechnology and Biological Sciences Research Council (BBSRC). To learn more about the Seeds of Discovery project, please go to https://seedsofdiscovery.org/.